Lactose is a naturally occurring sugar found in milk and dairy products that is broken down in the small intestine by the digestive enzyme lactase. Roughly 10% of adults in the US are lactose intolerant. Lactose intolerance is caused when the body cannot produce enough lactase to effectively process or digest lactose. 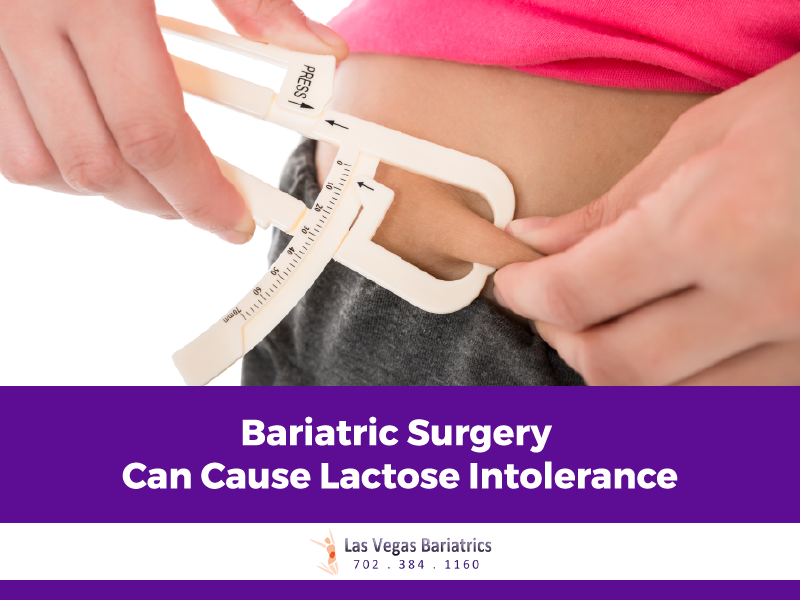 Unfortunately, lactose intolerance is among the most common side effects resulting from gastric bypass and other bariatric surgeries. In such cases, refraining from consuming milk products is vital to avoid adverse physical reactions. Lactose intolerance can cause cramping, abdominal pain, bloating, flatulence, indigestion and diarrhea. How Does Lactose Intolerance Develope In Post-Op Patients? When someone with a healthy stomach drinks milk, it first gathers in the stomach before continuing its journey into the small intestine. The milk isn’t released into the small intestine all at once, however. It is slowly released so as to ensure a sufficient amount of the lactase enzyme is present to gradually digest the lactose. After a gastric bypass procedure, milk travels into the small intestine at a much faster rate. The larger volume of milk entering the intestine all at once exhausts the body’s supply of available lactase, and lactose intolerance symptoms occur. If you are having trouble processing lactose following a bariatric surgery, it is highly recommend that you stop consuming milk products. While this can be challenging for some patients, there are many lactose-free and alternative milk products to help calm your cravings. You should also avoid soymilk products or any sweetened milk substitute. High sugar products are not conducive to your diet following surgery. There are plenty of unsweetened alternative milk products to choose from including almond milk, coconut milk, cashew milk and lactose-free milk, which has lactose removed through processing. A wide range of dairy free products are available in all grocery stores making it easier than ever to accommodate a lactose free diet. It is important to get in the habit of reading food labels thoroughly, as many less obvious processed foods contain milk or milk-based ingredients. Always check with your doctor to make sure that the products you choose are appropriate and won’t cause you any further digestive problems. Dr. Bernie Hanna has years of knowledge and experience concerning the potential side effects of bariatric surgery. If you are experiencing problems with lactose following a gastric bypass or other procedure, contact our office today to meet with Dr. Hanna.